The Government of Alabama is structured by the Constitution of Alabama which was sanctioned on 1901 . It is the sixth Constitution and is recognized as the lengthiest effective Constitution in the world. The body of the Constitution is categorized into three distinct sections, namely Executive power (Governor of Alabama), Legislative power (Alabama State Legislative) and Judicial power (Judiciary of Alabama). The Executive branch renders the executive power to the Governor of Alabama, the Lieutenant Governor of Alabama, the Governor’s cabinet and the executive officials. The Governor is the chief executive head of the state’s Government, elected to the Alabama House of Representatives. Alabama is defined by the open primary system of voting in which registered voters do not have to be members of any party. The cabinet is formed by the appointed heads of 25 different departments. Alabama is the only state in which the Governor and the Lieutenant Governor are elected separately. The Governor of Alabama is elected by the Alabama gubernatorial election held every four years. The role of the governor is complex and demanding and he/she is obliged to execute and abide the Constitution and the state law. The governor may serve the State for any number of terms but not more than two consecutive terms. The Governor can exercise his/her executive power and functions as the head of the state’s military forces. acted by the state legislature which can be accomplished by attaining simple majority within the upper house and the lower house. He/she can exercise some judiciary power to a limit and can excuse convicted criminals except in the cases when an official is convicted of unlawful activities. The Lieutenant Governor of Alabama is an elected Constitutional officer popularly elected every four years during federal midterm election years. He /she must be at least 30 years old, an American citizen for at least 10 years and a resident of Alabama for at least 7 years. The Lieutenant Governor has a solid influence as the ex-official president of the state and the second in line to succeed the governor of Alabama. The lieutenant governor is not permitted to hold any federal or state office in Alabama during his gubernatorial term. The Lieutenant Governor of Alabama can also appoint members and chairs of senate committees and indirectly exercise the power to determine which legislation is referred for consideration. The Lieutenant Governor has the right to vote only when there is a tie situation and to break the tie. Office of the Lieutenant Governor of Alabama. The executive officers, cabinet and legislature members, county level officers are all elected under the Alabama state constitution and these officials serve four years term simultaneously with that of the governor. The Alabama Legislature is the law making and supervising body of the state government of Alabama. The legislature is divided into two separate assemblies, namely Alabama House of Representatives and Alabama Senate. The Alabama House of Representatives, consisting of 105 members , is the lower house of the Alabama legislature. Each member represents each district and he/she can serve for four-year terms in the house. The two legislatures have equal powers but all revenue raising matters must be proposed and approved in the Alabama House of Representatives. The two assemblies meet at the Alabama State House in Montgomery. The Speaker of the House is the presiding officer of the assembly who is elected by the members of the house through a House resolution. It is a leadership position and he/she must administer the majority party agenda and delegate the duty to the members of the house. The Speaker and Speaker Pro-Tempo-re, the Chairmen and the six representatives are all elected by the House. The Alabama Senate, consisting of 35 state senators , is the upper House of the Alabama legislature. All senators can serve a four year terms, alike the House of Representatives. The Alabama senate has the exclusive power to approve certain appointees designated by the constitution and by the statute and also has the power to revise the revenue bills proposed by the House of Representatives. The Lieutenant Governor of Alabama is the presiding officer of the senate who has the right to vote only to break a tie. The president pro-tempo-re is the second in rank to preside over the senate who is elected by the members of the senate through a voting system. The Judiciary is the system that employs and applies law (but prohibits making law) and regulates any disputes ensuring justice in the state. It encompasses the essential panel of the Supreme Court/Constitutional Court and the lower courts of the Judiciary. The Judiciary has the authority to review the legislative and the executive actions. Courts with judicial review power may nullify the Government laws and rules that contradict with higher authorities such as the primary legislature or State Constitution. The Supreme Court of Alabama is the court of highest appeal in the state of Alabama and has exclusive judicial and administrative liabilities. The court consists of a chief justice and eight associate justices who are elected for six year terms. The Supreme court has the exclusive legal power to retrospect the decisions made by the other courts, to enact legal actions over which no other court has the right to and the power to settle any disputes involving an amount that exceeds $50000 . 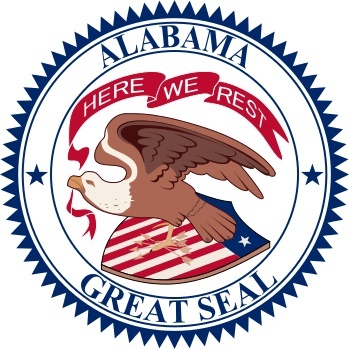 The Lower Court of Alabama consists of Alabama Court of Civil Appeals, Alabama Court of Criminal Appeals, Alabama Circuit Courts, Alabama District Courts, Alabama Municipal Courts, Alabama Probate Courts, Alabama Court of the Judiciary and Federal Courts. The taxes levied by the state of Alabama largely depend on the income and the expenditure of the people. Alabama’s property taxes are very low while the income tax on poor working families is very high. Alabama is the only state that imposes tax on a family of four with an income as low as $4,600. Additionally, the state also levies taxes on food and groceries without any exemptions for the low-income families. The Government of Alabama has many other important arms which are essential for the functioning of the system. The other executive branches include-Office of the Management and Budget(OMB), Office of the Director of the National Intelligence, Office of the United States Trade representatives, The White House. The Alabama Department of Agriculture was created by a state legislative act and it became operational since 1883. The department oversees all areas of agriculture covering all aspects of livestock market, livestock brands, livestock dealers, fertilizers, seeds, and feeds. The Alabama Department of Commerce is very much interlinked with the lives of the people of Alabama as it facilitates in enhancing the living standards of the people. It helps to strengthen the economy and resources of the state by promoting trade, technology, economic growth and development. The department works effectively to create more job facilities and assists in the progressive growth of the community. President/Thomas R. Bice, Ed. D., Secretary and Executive officer/Elle B. Bell, Vice President/ Jeffrey Newman, President Pro Tem/ Al Thompson/ Betty Peters/ Stephanie Bell/Yvette Richardson, Ed. D., /Charles E. Elliott, M.D.,/ Mary Scott Hunter). The state board works concurrently with 67 county boards and city boards of education and is responsible for the whole structure of public primary and secondary education. The Alabama Department of Health and Human Services maintains high standard of protecting and upgrading the general health and environment of the state. It devotes in augmenting the heath and living standard of the people by providing optimum heath regulation services and policies. Each public health area is under the purview of an area administrator. The Alabama Department of Labor tends and manages all state and federal laws which directly impacts job seekers, workers and retirees. It protects worker’s safety and health, wages and hours, labor market, unemployment compensation, tax rate, family, medical care and medical leave. The Alabama Department of Transportation is a liaison of multiple networks consisting of roadways, airways, railways and waterways. The cities are interlinked by 5 major interstate roads and several U.S highways that crisscrossed the state. The aviation sector has also expanded over the years and renders viable commercial operations with numerous major airports (Birmingham-Shuttles worth International Airport/ Huntsville International Airport/Dothan Regional Airport/Montgomery Regional Airport). The railways are also an essential mode of transportation of passengers as well as commodities. The Amtrak passenger train provides intercity and interstate connectivity services. Major waterways include-Port of Mobile, Port of Montgomery, Port of Florence, port of Birmingham. The Alabama State Treasury Department plays a significant role in safeguarding the financial security of the state and also to promote economic prosperity. Additionally, it is responsible for cash management, unclaimed property, Alabama Trust Fund and producing coins and currency.